US Duct manufactures standard and custom industrial cyclones. Do you have a unique application? Our seasoned fabrication technicians understand cyclones and the related airflow dynamics for a variety of applications. Industrial Cyclone Separators are viable options for many industrial applications that commonly challenge bag houses and cartridge filters. When the air stream is heavy with debris, large particulate or abrasive material, the filtration process can be very taxing on bag-houses and other filter systems. Cyclones can improve system performance, reduce maintenance time and extend filter life by removing significant amounts of particulate from the stream before it arrives at the filter. Industrial cyclones can be used as a part of simple collection solution as well. 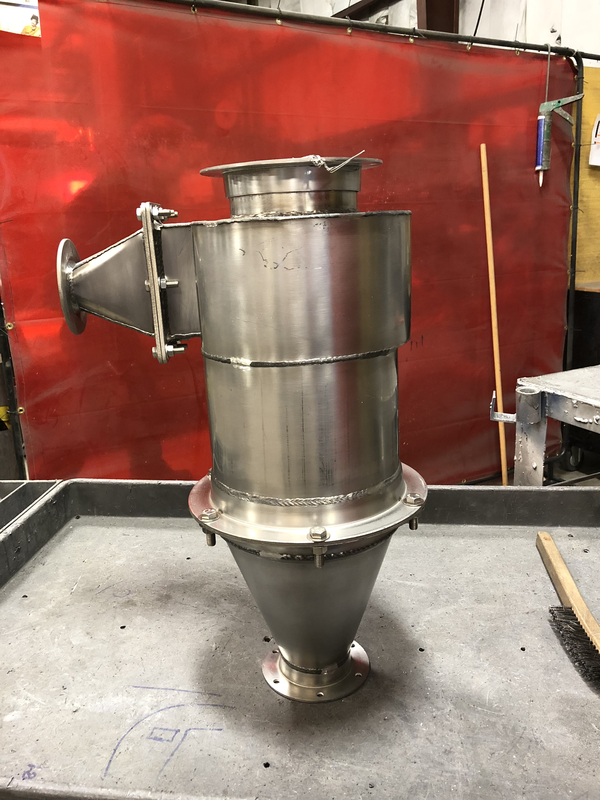 Paring a cyclone with an after filter box - where the industrial cyclone acts the primary separator and the after filter as a secondary air cleaner – can provide a total collection solution without the need of a collector. Cyclone manufacturing has a variety of complex considerations. US Duct understands cyclonic separation. Industrial cyclonic separation is a method of removing particulates from an air, gas or liquid stream, without the use of filters, through vortex separation. A high speed rotating flow is established within a cylindrical or conical container called a cyclone. Within the cyclone, air flows in a helical pattern, beginning at the top of the cyclone and ending at the bottom end before exiting the cyclone in a straight stream through the center of the cyclone and out the top. Larger particles in the rotating stream have too much inertia to follow the tight curve of the stream, and strike the outside wall, then fall to the bottom of the cyclone where they can be removed. In a conical system, as the rotating flow moves towards the narrow end of the cyclone, the rotational radius of the stream is reduced, thus separating smaller and smaller particles. Thus, manufacturing an effective industrial cyclone requires the understanding cyclone geometry, which together with flow rate, defines the cut point of the cyclone. This is the size of particle that will be removed from the stream with an approximate 50% efficiency. Particles larger than the cut point will be removed with a greater efficiency, and smaller particles with a lower efficiency. Want more information? Download our Industrial Cyclone Spec Sheet/Flyer. Interested in exploring industrial cyclone separators as a product offering for your business? Talk to an expert Duct Guy. Ask an Expert Duct Guy.